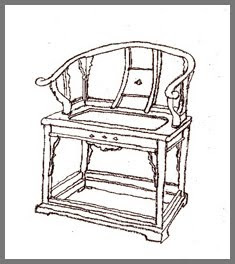 The word CHAIR (isu　椅子　いす) just like this is a topic for haiku. But we do have a kigo also. An item to bring some coolness to the living room. The following types of special Japanese chairs are not kigo. zaisu 座椅子 "chair to sit on"
A typical Japanese chair without legs to be used on tatami mats. They range from simple wooden structures to almost armchair comfort ... just without legs. Some can be folded, others can be rotated, they fit all purposes and a Zen priest can even use it to sit in the zazen-fashion also. lit. 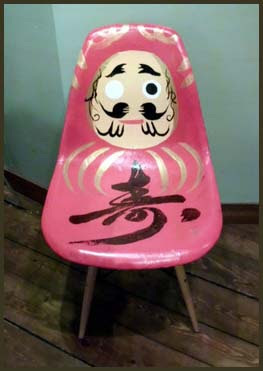 "chair to sleep on"
A Daruma Chair to bring you luck ! "ka cho-fuei (kachoo fuuei 花鳥諷詠)"